KEY WEST, Florida Keys — Subtropical Key West is widely credited with inspiring singer/songwriter Jimmy Buffett’s smash hit “Margaritaville” and other tunes. Thursday through Sunday, Nov. 3-6, some 3,500 of Buffett’s “Parrot Head” fans are to spread their wings on the island during their 20th annual convention. The convention is titled “Don’t Stop the Carnival,” recalling Buffett’s album and stage play based on the Herman Wouk novel of the same name. Events include a concert by Buffett’s Coral Reefer Band, beachside performances, a charity auction and raffles, the TropRock Music Awards, a street festival with live music and a “Beach Bash” at the Casa Marina, a Waldorf Astoria resort on the Atlantic Ocean at 1500 Reynolds St. The anticipated entertainment highlight is a showcase at the Casa Marina by the entire Coral Reefer Band. Members include songwriter/performer Mac MacAnally, keyboard master Michael Utley, steel drum wizard Robert Greenidge, guitarist Peter Mayer, pedal steel guitar player Doyle Grisham and vocalists Nadirah Shakoor and Tina Gullickson. Convention attendees also can enjoy music by favorites including Howard Livingston and Mile Marker 24, John Frinzi, the Sunny Jim Band and more. Even Buffett himself occasionally makes a surprise appearance. The internationally acclaimed entertainer, whose lyrics contain frequent Key West references, established his first Margaritaville Store and Margaritaville Café on the island and maintains a recording studio overlooking the former shrimp docks. 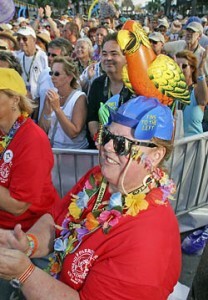 Events at the Casa Marina are not open to the public, but only to registered Parrot Head club members. The public can attend the Margaritaville Street Fest, planned for 1-6 p.m. Friday, Nov. 4, near Margaritaville at Duval and Fleming streets. Scheduled entertainers include the Young Rebel Goombas, Mr. Myers Band and Michael Armstrong & the Key West Band. As well as Buffett’s music and associated tropical lifestyle, Parrot Heads embrace charitable, environmental, educational and humanitarian activities. Since 2002, members of the more than 200 national and international Parrot Head chapters have contributed $22.1 million and nearly 2.7 million volunteer hours to local and national charities. The first Margaritaville was not in Key West, rather in Gulf Shores, Alabama where the Walgreens is now.